The notion of limitless possibilities was the overarching theme of a series of events put on by the Young Professionals Network (YPN) at the 2015 Esri User Conference in San Diego, California. 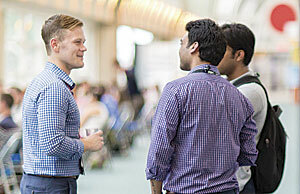 Esri account manager John Dombzalski (left), who helped launch the Young Professionals Network, speaks with young GIS professionals at a social event. 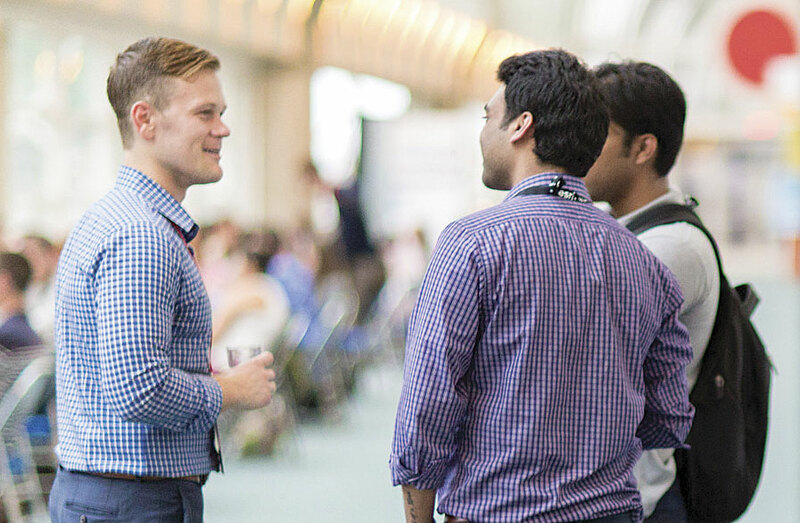 The YPN, in its inaugural year, offers budding GIS professionals—of any age—the opportunity to network with peers and meet some of the most dynamic and influential people in GIS. "It's about bringing as many people as possible together to share their experiences," said Esri account manager John Dombzalski about the network, which he helped launch. "It truly originated out of the need to grow a younger generation of GIS professionals." YPN events, which included two social gatherings and three panel discussions, revolved around familiarizing GIS neophytes with the diverse backgrounds and multiple perspectives that constitute this wide-reaching field. "I think it's a good opportunity to network and find out what other people are doing," said Joel Carter, a software developer for Cardno, an infrastructure and environmental services company. "I've especially liked seeing all the different ways people approach the field," said Rachael Sclafani, a senior in environmental studies at Pennsylvania's Dickinson College, who learned GIS for a class and plans to continue using it in her career. Attendees heard from Esri leaders who got involved in GIS in a myriad of ways—via startups, graphic design, and even sports. They also got a sense of how much the field is growing, with big data getting even bigger and university GIS programs becoming more conventional. At a question-and-answer session, Esri founder Jack Dangermond expressed his hope that these GIS newcomers and their mentors would build strong connections sowed in friendship. "I want to see a great network occur…where you get together again and again and you have fun, actually, and you learn from your friends," Dangermond said. That is because he believes that the best way to learn things is in the context of good friendship, as camaraderie begets trust. "There's nothing like hearing from your friends," he continued, "because they actually share…experience to experience." By the end of the week, the roots of a durable network were taking hold. "I think it's a good idea to have this [organization] because it's cooperative," said María Pinheiro, a GIS analyst for the Instituto Pereira Passos, the research department for Rio de Janeiro's city government. "It's good to know I have some friends and expectations for my career in GIS." Stafin Duncan, who built the GIS network for his company, Belize Electricity Limited, without prior experience with the technology, was ready to take on the role of mentor. "I'm a firm believer in fostering the youth as the next generation of developers," he said. While the directors of the YPN collate ideas for how to best grow the network, they are putting together a packet on how to be a GIS mentor, especially for primary and secondary school students around the globe. This, along with other materials and information about events, will be posted on the YPN website. To stay informed about the YPN, register online and follow @EsriYPN on Twitter.